You can afford to be creative with HP Instant Ink: Save up to 50% on ink and never run out. Print lab-quality photos at home for pennies. Full of value. Print up to twice as many pages or photos with Original HP high-yield ink cartridges. Get high-quality prints-time after time-with an all-in-one designed and built to be reliable. Easy photo printing from your mobile device: Your device, your choice. Easily print documents and photos from a variety of smartphones and tablets. Start printing and get connected quickly with easy setup from your smartphone, tablet, or PC. 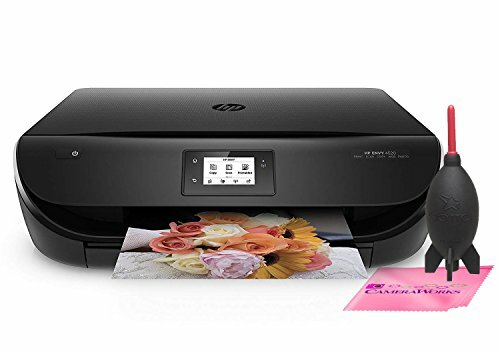 Connect your smartphone or tablet directly to your printer-and easily print without accessing a network. Everything you need to create: Print, scan, or copy quickly and easily with the 2.2-inch (5.5 cm) display-simply touch and go. Save paper and conserve resources-use up to 50% less paper with easy, automatic two-sided printing. Print borderless, lab-quality photos, laser-quality documents, scrapbook pages, and more-right in your home. Do more in less space: Save your space with a sleek, compact all-in-one designed to fit where you need it. Print in any room you choose-without causing disruptions-using the optional quiet mode. Access menu planners, news reports, recipes, and more with free HP Printables-delivered on your schedule. Mobile printing: print from anywhere using your smartphone or tablet with the free HP ePrint app, easily print from your iPhone or iPad with AirPrint, print even without a network using Wireless Direct printing | Borderless photos are printed right to the edge of the paper. You get beautiful photo prints with no trimming! Choose an ink replenishment service: Let your printer track usage and have ink delivered before you run out. Either reorder Original HP 63 ink cartridges only when you need them through Amazon Dash Replenishment, or save up to 50% by paying for pages printed through HP Instant Ink. If you have any questions about this product by Camera Works, contact us by completing and submitting the form below. If you are looking for a specif part number, please include it with your message. Steam Train Picture on Stretched Canvas, Wall Art Décor, Ready to Hang! Legends Never Die San Francisco 49ers - Montana-Rice Framed Photo Collage, 16" x 20"